The weakening ocean: This is a schematic of the circulation in the western North Atlantic during episode of strong (left) and weak (right) westward transport of the Labrador Current (LC). 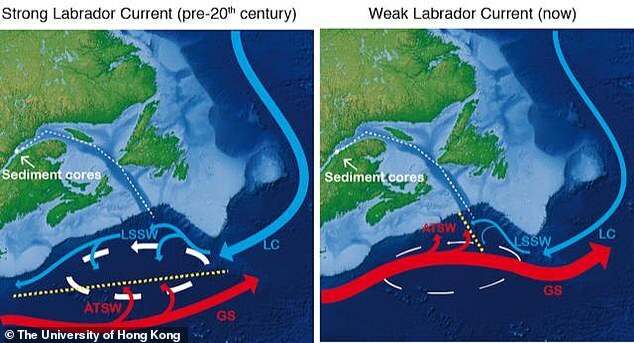 The oceanography of this region is characterised by the interaction of water masses formed in the Labrador and moving westward (LC and Labrador Sea Slope Water (LSSW)) and the water masses moving eastward originating as the Gulf Stream (GS) and its Atlantic Temperate Slope Water (ATSW). The exact location where these two water mass systems meet (yellow dashed lines) is determined by the strength of the northern recirculation gyre (white arrows), which then control the temperature.